Hello all! 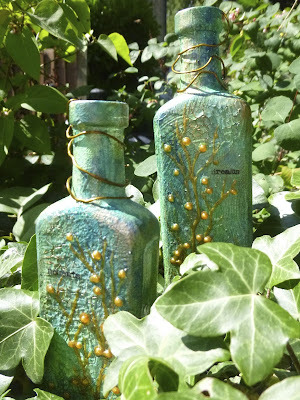 After all the Guest Designing (Magic Potion Bottles for Anything But Cute) and Guest Hosting (Crackle Tag for Tag Along - do come and play with me! ), I'm back with a sneak peek today... and I'm happy to say I've been at the Glampunk again over at Calico Craft Parts. At the time I was working with them, these were prototypes, but I'm delighted to say they are now available in the Calico Craft Parts shop. Do check out the fabulous new Steampunk designs there, including this wonderful steam pipe collection, the Pipework Maze set. If you want to see them in action properly, please hop over to the Calico Craft Parts blog and check out my Steam Pipe Trunk Distribution Venue (calling all West Wing fans... those mystified by the reference will find enlightenment here). I hope you all have a fabulous week. Here's hoping September will usher in some better weather for poor damp Great Britain! Thanks so much for stopping by, and I'll see you again very soon. No steam or gas ever drives anything until it is confined. No Niagara is turned into light and power until it is tunnelled. No life ever grows until it is focussed, dedicated, disciplined. With oodles of Heirloom Gold Perfect Pearls in the background and on the pipes themselves, and with those little touches of old gold from the gears and the bulbs, I'd like to add this to the Touch of Gold theme at Frilly and Funkie, if you're willing to travel to see the whole thing! Hello all! I've got another exciting post today... 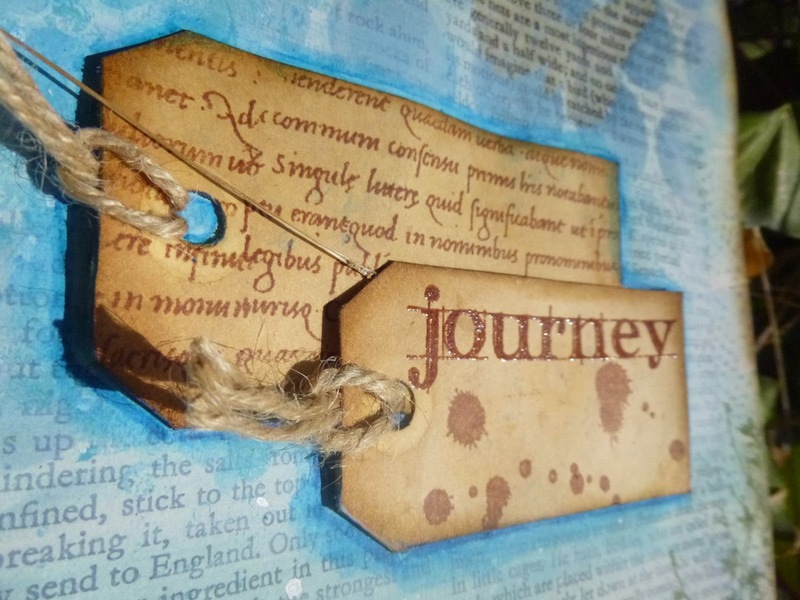 I'm absolutely delighted to be a guest host at Tag Along and the theme I've chosen to challenge you all with is Crackle (okay, no huge surprises there!). Because it's summer, and people are coming and going from holidays, you'll have a whole fortnight to play rather than the usual week. I'm just sharing a sneak peek of my Crackle tag today. You can see the whole thing over at Tag Along to inspire you, and I'll be back in a few days with the making-of details. If you'd like to take me up on the challenge, all you have to do is create a tag which involves some form of crackle - whether that's stamping or stencilling or a glaze or a paste or good old glue-crackle or indeed any other crackle you can come up with - post it on your blog, and leave a comment over at Tag Along which includes a link to your post. I do hope you'll be able to come and play Crackle with me at Tag Along this fortnight! I'm also putting in a special guest appearance at Anything But Cute this week... and there's lots of crackle going on there too. 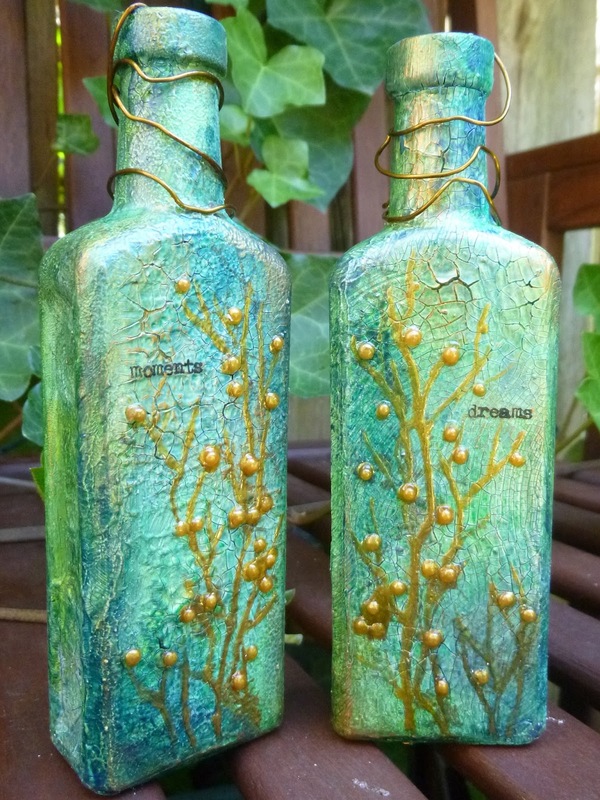 Do check out my magic potion bottles if you missed them. Hello all! I'm very excited today to be able to invite you over to Anything But Cute to see my Guest Designer project for them. I was delighted when Pamellia contacted me, but also a little daunted as the team there create such amazing work. It was up to me to choose what to create, but I couldn't resist the beautiful moodboard for the Making Magic theme this month, and so that's what inspired my altered bottles. I'm only sharing a quick look here at Words and Pictures today, so f you'd like to see how they came to life, please hop over to Anything But Cute for the full details. And I hope they might inspire you to play along there this month if you haven't already. Thanks so much for stopping by today. I've got some more exciting guest duties to share with you tomorrow, so I hope you'll be back soon! In a bit of serendipitous timing, I'd like to offer these up at Frilly and Funkie with A Touch of Gold. It's not just Ground Espresso - love, love, love it! - but also Blueprint Sketch and some good old Stormy Sky in the mix. First of all I used Distress Sprays, spritzed onto the mat and wrinkle-free distressed up again onto the tags. And then some inks blended on and spritzed and flicked. Very happy with the backgrounds, so I needed to not cover them up too much. I also needed to make sure whatever I stamped would show up against the dark mysterious depths, so it was out with the Vanilla White embossing powder and the delicate daisy stamp. I cracked open my new Ledger Script stamps to add some detailing in the background. Some of the text is stamped in Stormy Sky and clear embossed so that it shimmers. And some of it is stamped in Picket Fence Distress Paint to add lighter highlights. I used just a hint of watered down Faded Jeans Distress Paint to shade the petals and leaves. Just love the ghostly look it gives the flowers. Since there was a bit of paint left on the mat, I splattered the rest around the tag surfaces. ... softened with Stormy Sky and Antique Linens DIs, and with a shading of Ground Espresso around the edges to bed them in to the tags. It's so lovely to have new blues and browns to play with! Of all the new colours so far, Ground Espresso has shot to the very top of the favourites list - and it's challenging the original browns too. There's just a wonderful, wonderful depth and richness of colour to it. You can see why I had to put other crafty deadlines and dull administrative chores on hold (though at some point I'll need to do some invoicing so that I can be paid!) in order to play with it. Simple toppings - lightly dyed seam binding and some twine - and we're pretty much done. It had to be indoor photos since there'd be an almighty spritz and flick disaster if I tried to take these outside to photograph in the pouring rain! And now I'd really better get on with some of the stuff I'm really supposed to be doing today. Hope to be round to visit soon, and I hope your Sunday is sunnier than mine! Repeat Yourself at the Stampotique Designers Challenge - as so often, I have created in double - mirror images and repetitions are built into my creative process! Sending You Flowers at Try It On Tuesday - so long since I've managed to play along there!! Hello all! I'm gradually making my way round catching up with you all - if you haven't seen hide nor hair of me yet, I'm sorry, and I will get there!! I'm glad you enjoyed waiting in the lamplight with Lili Marlene in the meantime - nothing wrong with a little romance now and then, eh? 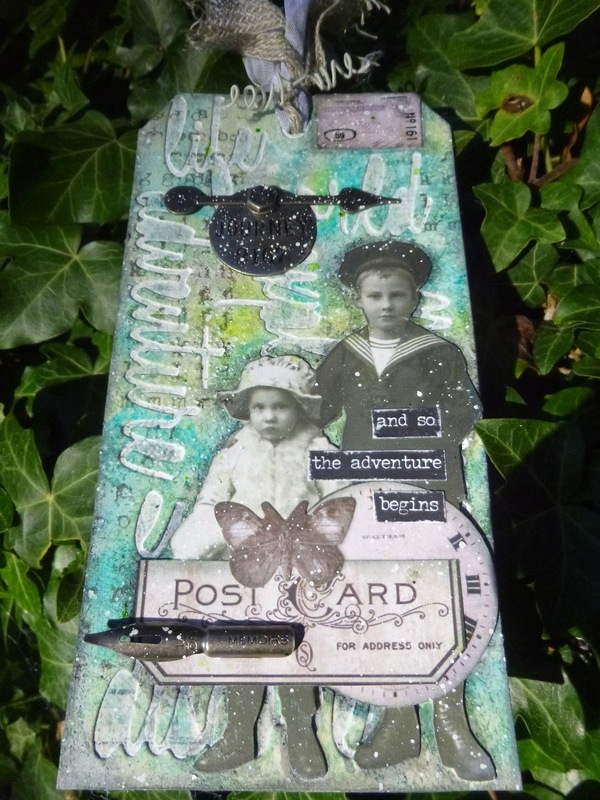 Today I'm back to share my take on Tim Holtz's fabulous inspiration tag for August, and this time it's the romance of childhood nostalgia. I stuck pretty closely to the techniques, so you can't do better than check out Tim's own tutorial for how it was all done. I've been using Hickory Smoke again - I particularly love how it echoes the colour tones in the Idea-ology ephemera and the photos, as well as the pewter metal pieces. In any case, I had a lovely time selecting adventurous travel words and juggling them onto the tag. I've used the Script thinlits rather than the block lettering. And my background paper also captures the world travel theme - it's from the Correspondence paper stash. I couldn't resist having another little play with the colours I used on my Lost Lives tag. It's a combination of three of the new Distress Colours - Twisted Citron, Mermaid Lagoon and the to-die-for Hickory Smoke. And when it came to adding medium over the top of my inky colours, I dabbed it on with some paper towel rather than applying with the brush, which meant I could preserve a little more of the colour separation. It also gives a great stippled texture to the finished background. It's deliciously tactile! Something always happens to my insides when I work with siblings - and these two are no exception. I love the quiet determination in the brother's face, and that reassuring arm around his little sister's shoulders. His sailor suit is adorable - absolutely the fashion of the time for small children - and perfect for setting forth on the journey through life. She doesn't look quite as confident about the journey ahead - perhaps she knows that life's adventures are unlikely to unfold quite as smoothly for a girl as for a boy. 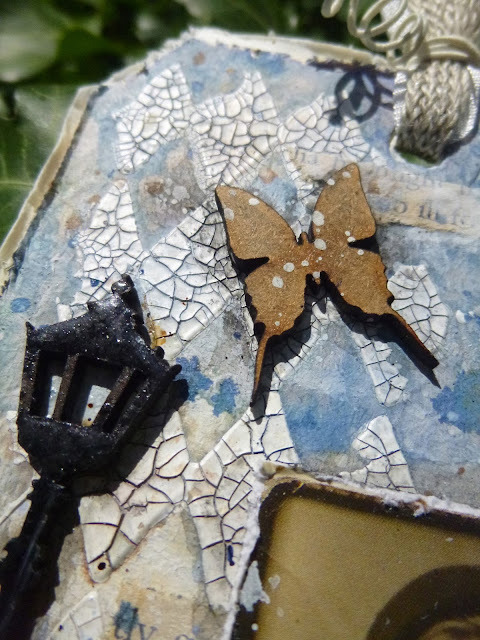 The butterfly comes from the Thrift Shop Ephemera pack and I love him (wish there was a whole packet of butterflies! ), but I'm even more pleased with the other bits of ephemera. They come from the new Idea-ology Pocket Cards. I just got them and I'm delighted with them. They come printed with all sorts of Tim images and designs, and in several sizes - so there's always one just right for what you need. So useful and so many in the packet...! So the clock is cut from one of the Pocket Cards and so is the postcard tab. The little postcard at the top is also cut from one of the Pocket Cards and, as Tim did, I've added some extra rub-ons. The smallest version of these postcards (there's a whole card of them) will be making its way to my mother's dollshouse museum, Small Worlds - they're the perfect size for cutting up and leaving on hallstands and tables in some of the houses there. The pen nib is there so that either or both of our siblings can record the story of their travels in their memoirs! Mushroom alcohol ink has become a must-use colour since Tim mentioned it in one of his CHA videos a while back - love how it mutes and ages the metal so subtly. My stamping and edging is done in Hickory Smoke ink and Distress Paint - an altogether softer, smokier look than Tim's grungy black... I just wasn't in a grungy sort of mood, and you have to follow your heart. For the topping I've used my current favourite combination - some crinkle ribbon, some linen ribbon and a twist of Prima's wired thread. You saw it on the Lili Marlene tag, and it's coming up again soon on an exciting little extra I'm squeezing into my schedule (I know - what a tease!). And so the adventure begins... I wish this sibling pair well on their journey through life. And I wish a huge vote of thanks to Tim for another amazing inspirational tag. I had so much fun with this. It's particularly nice, when I'm so busy, to have the guidelines already laid down, so that I can just play without having to think too much. Tim's already done all the hard work! Thanks to you too for dropping by today, and I hope you're all having a lovely week. I'd also like to share it at the Simon Says Stamp Monday Challenge where they're looking for Citrus With a Twist - well, I've used Twisted Citron, and I've also got my twisty twirly thread in the topping, so I hope that will do! Hello all! Thank you for putting up with my catch-up posts lately, bringing DT projects into the Words and Pictures fold. I'm happy to say I have something new to share with you today but I've only a sneak peek for you here. If you'd like to know who's waiting under the lamppost attracting men like moths to a flame, I'm afraid you'll just have to hop over to Calico Craft Parts to find out. I've finally got some spaces in my schedule so I'm looking forward to doing some catching up of my own around Craftyblogland, so I'll hope to see you out there. Have a wonderful week everyone! Darling I remember the way you used to wait. My Lily of the lamplight, my own Lily Marlene. All being well, I should be en route to the States later today, and these pages provided a little respite in a crazy August of work and admin and preparation and packing. I started from the idea of wanting to "preserve" some of the original book text, and I used Katy Leitch's butterfly silhouettes to do it. They're stamped in Versamark and then clear-embossed. Through all the later stages I did my best to keep them clean and clear so that the text would stay fully present. I do like how they'll still catch the light and gleam at certain angles. I sponged through the mask with the Turquoise Fresco and then did some shading and highlighting with pastel pencils. 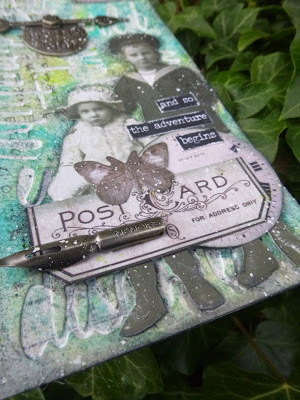 Over that I stamped the Artistic Stamper Large Random Dots in both the Chalk and the Turquoise. And finally I did some spattering with the inner stick of the Dylusions White Linen spray. I seem to be a little bit obsessed with the meadow grasses from Tim's Spring Sprung stamp set at the moment, so they put in an appearance along the foot of the page. And I used the Mini Polka Dot Background to add extra texture around the sky. 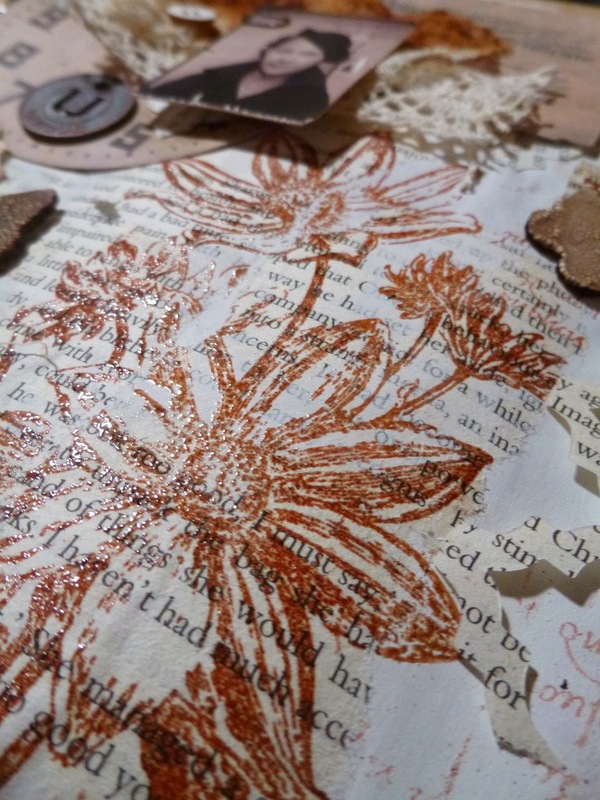 The tags had been soaked in tea and coffee, and then I stamped the beautiful Calligraphy Mat 4 in Sepia Archival Ink. The large words from Journalling Words 2 are stamped in Sepia, as are the blots and splotches from the Katy Leitch Messy Art plate. The big words got a bit of clear embossing for that magical extra shimmer. Once they were glued down, I used a couple of Inktense pencils to shade and outline them. I really love how that makes them pop against the turquoise sky behind. And I tied some rustic twine through the tops of course. There's a little bit of Vintage Photo and Gathered Twigs inking all the way around the edge, but that's about it. This was just a little oasis of calm in my crazy August, and I had a lovely gentle time playing with it! Back to the present, and thank you so much for stopping by. I'll be back on Monday with a brand new creation to share, and I'm hoping I might even get some visiting in over the next few days. Either way, I hope you have a wonderful weekend and I'll see you soon. Be gentle with yourself. You are a child of the universe, no less than the trees and the stars. In the noisy confusion of life, keep peace in your soul. Hello all, and a very warm welcome to you. I'm still caught up in real-life work - hence my long absence around Craftyblogland - so I'm filling in here with a project which was originally shared over at The Artistic Stamper as part of my DT duties there. Regulars will know I like to gather all my projects here at Words and Pictures, my virtual scrapbook, so if you commented the last time around, please don't feel you have to do so again. Here's what I wrote about this journalling page at the time. 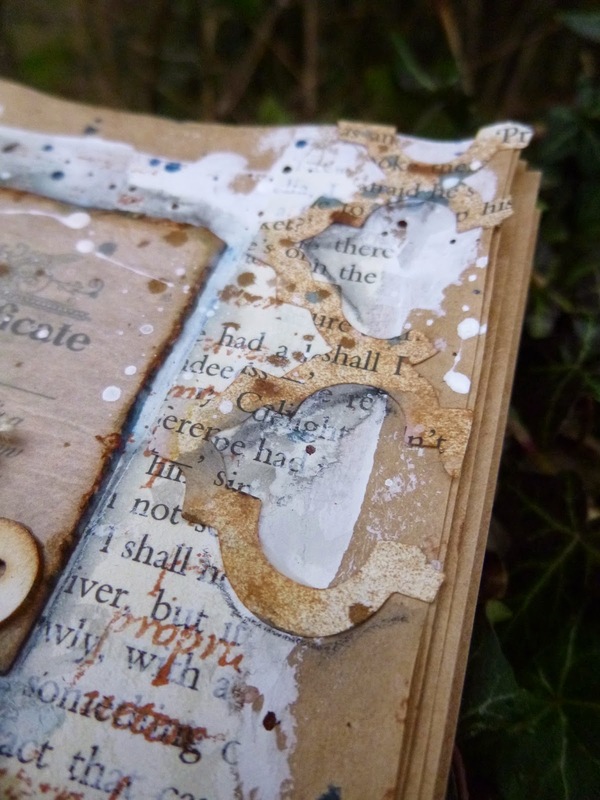 I started by layering torn book pages and heavy gesso into a kraft-paper journal (still working through the pages carved out of my candle niche!). The next step was some stamping... the Encyclopedia Botanica flower and one of my favourite Calligraphy Mats, number #4, stamped in Sepia, and with clear-embossing for the flower to give extra definition. 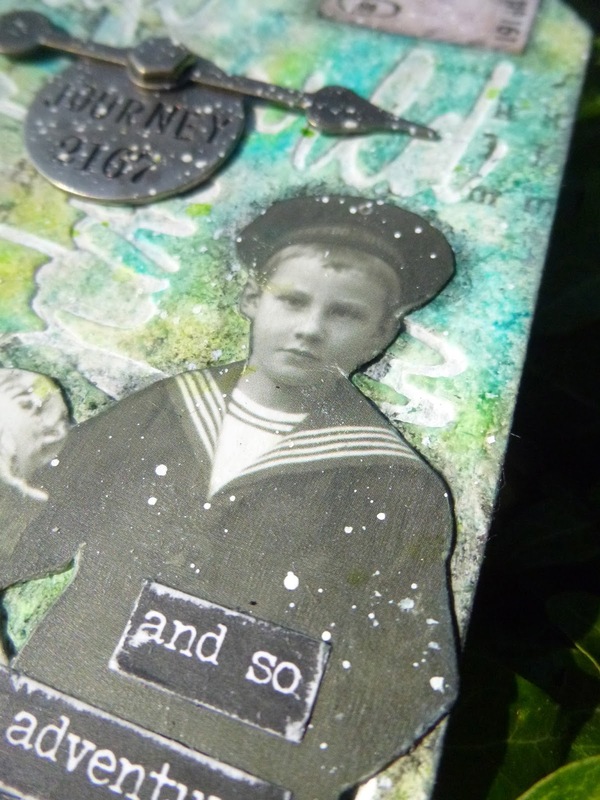 I then started playing around with ephemera and embellishments and it all came together without me really thinking very hard. This wonderful young woman from the Darkroom Door Photobooth sheets was really the catalyst. The determined set of her mouth and the humorous gleam in her eyes drew me to her at once. Here's someone setting out into the world with her head screwed on straight and ready to pursue her desires. 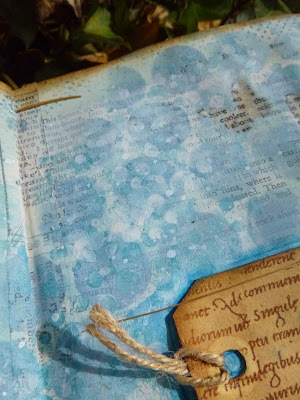 She's layered up over some Tim Holtz ephemera, some shabby lace and some stained calico from when I did my last rusting session (a long time ago... there needs to be another one very soon). The journey she takes will undoubtedly be full of twists and turns, but you can bet your bottom dollar she'll grit her teeth and come out smiling in the end. This word from Journalling Words #2 seemed the right one for her. 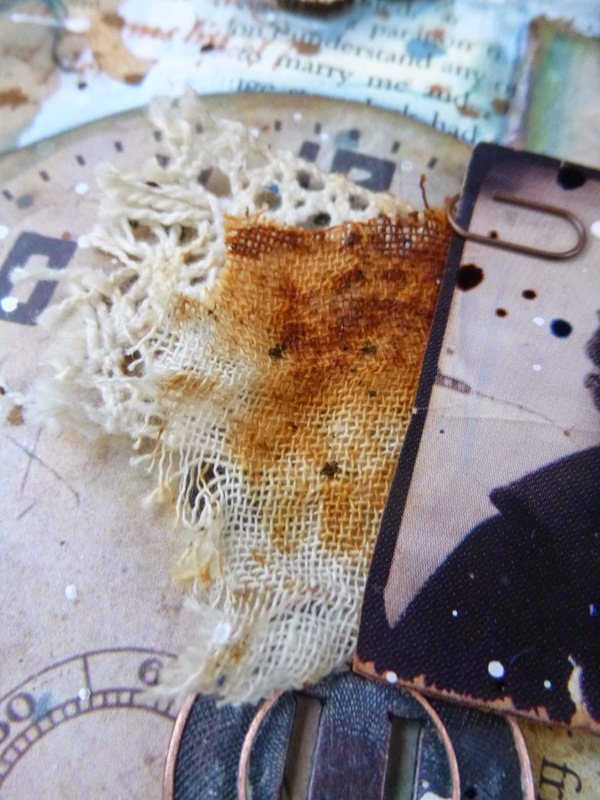 The layers here include some more of the rusty calico as well as some tea and coffee-stained tissue paper. Here they've had lots of shading (with Inktense pencils and a water brush) to embed them in the page. I found when I was looking at some of the photos that I couldn't make my eyes see them properly - they kept either sinking in to the page or sticking out - a sign that the shading for dimension is doing its job, I suppose. It was while I was creating the shadows around the Frameworks and the other ephemera - with various blue and grey Inktense pencils - that I decided the flowers might look good with some "sky" around them. I'm really pleased with how it makes the image pop. The other elements which made an early appearance in the plans were the wooden butterflies. I already like them in "naked" wood, but for this page I decided they should be crackled. 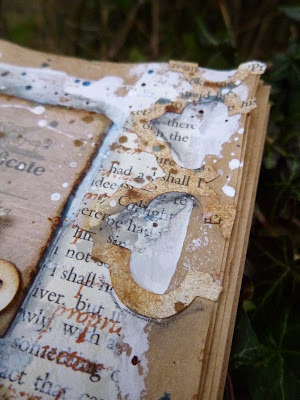 I used the Croco Crackling in White again (as on my last journalling page here). And then added splodges of Black Soot, Gathered Twigs and Vintage Photo Distress Inks, wiping back and adding more until I was happy with the grungy look. The little wooden buttons I did leave naked - though they did get caught in the splatter crossfire! 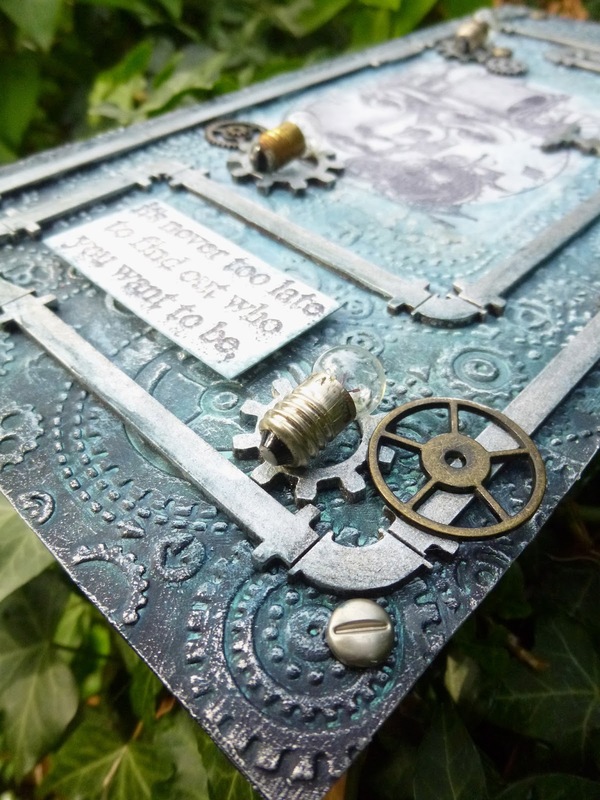 You'll have spotted the metal accents - some Idea-ology pieces that worked with my young woman... business like cogs and the Muse Token which is definitely hers by rights. I sanded it back to give it an extra burnished glow. So that's today's bit of fun. The journalling does seem to have taken hold, and I'm enjoying the freedom it's giving me to play. I'm hoping you're still enjoying the results! Back to the present, and thank you so much for stopping by today. There is honestly light at the end of the tunnel work-wise, so I hope to restore something approaching normal service here towards the end of the month. For now, I'd just like to say thank you for all your lovely comments and feedback. It's a joy to be on the journey with you all. 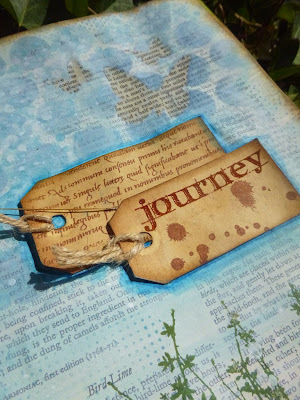 I soon realised that no journey carries one far unless, as it extends into the world around us, it goes an equal distance into the world within.